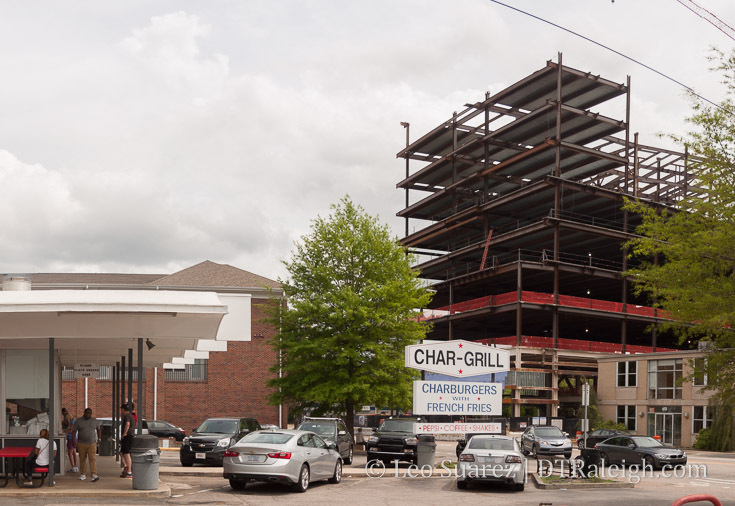 Char-Grill on Hillsborough Street. April 2018. I’ve been enjoying the new feel on Hillsborough Street with all the steel going up at One Glenwood. This block will hopefully see an increase in pedestrian activity and pump more lunch seekers on the southern end of Glenwood South. The former empty lot to tower conversion is some really great infill for downtown Raleigh and it’s exciting to see it come along. Get out and walk that area if you can soon! Don’t the developers of One Glenwood own what looks like the former First Citizens Bank building right next door to this project? @Robert – they bought the ugly 1-story NC Dept of Insurance building on the corner of Boylan and Morgan, as well as the Dram & Draught lot. The same LLC also owns the ugly squat former NC Insurance building at the corner of Morgan and Boylan. I imagine that will get redeveloped in the future. I also hope that the Dram & Draught gas station re-purpose stays, I think it looks cool – my only wish was that they said screw parking and made the whole parking lot a patio – maybe if they start getting more and more foot traffic from the surrounding redevelopment, they could. But alas- will probably be redeveloped when (my guess) the One Glenwood developers also buy that old 2-story next door (with the audio repair store). As for the Insurance building, I really doubt they’d build on top of that ugly thing. Tear it down! @Mark – your wishes will come true – both mechanic shops you’re referring to on that corner have been purchased by apartment developers (who have already built on Hillsborough further down), and both are zoned for 7 stories! parking coming with hotel and Dillion. @Tony, agreed! A thoughtful, attractive elevated walkway from the terminus of Glenwood to both sides of Hargett (once that road closes at the tracks) would make a wonderful connector between Glenwood South and the Warehouse District. Said it before…WYE LINE (google NYC High Line for pics). Connect from Glenwood dead end, over tracks, over to Warehouse dist, and maybe over to Boylan Bridge Brewpub. Would be an awesome way to connect Glenwood South, Warehouse district, Boylan, and maybe even Dix eventually! Hmm…since the Wye line actually is an old railroad trestle, maybe ours could be built to either look one, or incorporate salvaged trestle parts. Since it’s a pedestrian bridge, I still think some version of the old Martin St viaduct could be built in (obviously the new Union Station blocks the old spot) so you can walk right up to Rebus Works and PH7 again so they are not all isolated down in there. Any update on the hotel on Peace St? if I recall, West Street. Delayed again during this week’s council meeting. @Leo … delayed again? wow.. 2 more weeks? When is 400H going to start construction? Has 400H even announced any tenants? Until I see some indication they have some tenants, and hence, financing, there is no start date. Tony, the West Street extension became a separate, later project due to rising costs. It started off as part of the phase I scope for Union Station. There are plenty of dead-end streets downtown unfortunately. Lane, Dorthea, Cabarrus (x2), North (x2), Johnson, Davie, Halifax. I want them all reconnected, but money gets in the way of my legoland fantasies. When does 400H break ground? with a lot of shopping and entertainment. Jeff, thx U for updste. This might be off-topic but does anybody know the latest on the envisioned tap room at S Bloodworth / Hoke St? I drive by this construction everyday and love looking at the progress. Unfortunatel ywith stuff like this, the steel always flies up and right when you think the building will be completely in no time, the interior upfit and finishing reminds you how long a building of this size takes to construct. Can’t wait…. Unless you plan on working there I doubt you’ll see the interior much…has one Glenwood announced any retail tenants? I must say, this project, despite only being 10 floors, is quite visible since it’s located atop a hill. I noticed it today from quite a distance away driving north on Saunders St, and again while driving south on Glenwood Ave. It will have quite the impact on the skyline, and so will future projects in the immediate vicinity. Happy to see the smokey hollow project aka peace project starting to take height! @TheNightHawk – is it?? Does anyone know of a link to a construction cam for Peace fka Smokey Hollow? @Jake .. it is! Really exciting to see. Also, so new information regarding the Wegaman’s Site. Also looks like the Glenwood Two parking deck has taken height quickly as well. Anyone know anything about the Duncan-Parnell building at the intersection of Jones and Glenwood? Would be great if someone went in and bought that… great location.. and would help connect everything going on the south end of glenwood south the the rest of it. @TheNightHawk I really wish they added some residential to the Wegmans project, then I could understand them trying to brand it as a “Midtown” thing. I’m also concerned that hotel they talk about will be another with a big setback and surface parking like all the other Wake Forest Rd. hotels. TBJ is reporting a 1.3 acre parcel just north of the Masonic Lodge sold for $3.5 Million. Currently it’s empty, evidently it used to be a car dealership. I expect something similar to Palladium Plaza across the street. Just out of Curiosity But any Word on the N&O site and if any Developer is going to Build a 30+ story Tower there ? There hasn’t been any movement on that property since November. The new owners aren’t actually developers, so I don’t exactly know the timescale we should expect. John Kane’s Kane realty co. web site shows his latest office tower project, a 30 story tower. very impressive. I kind of wonder why this isn’t built downtown. ( ??? ) Can someone explain to me why the height requierments around Downtown ? The Dillon office tower is really nice and i hope to see more in the future along the warehouse district and in Downtown.